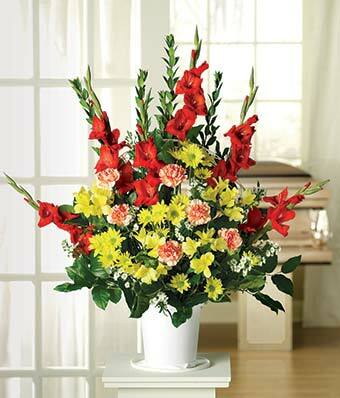 A vibrant sympathy arrangement overflowing with red gladiolus, bi-color carnations, yellow alstroemeria and more. Hand arranged by a florist, it is available for delivery to a funeral home to be displayed on a stand. Floral arrangement measures approximately 35"H x 34"W x 19"D.